Play top bird cages are great for the bird who likes to get out of his cage and play. You can put food, water and toys on the play top. Most of the play tops lift off so you can carry them to another room and set them on a table for extra variety in your bird's routine. 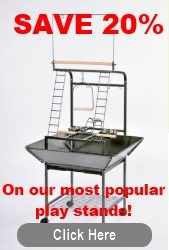 Did you find a Play Top Bird Cage to suit your needs? Exclusively focused on pet birds, our team prides themselves on finding answers. Here are 3 easy ways to reach them.